Sampson's is proud to be the exclusive New York licensee of biodesigns inc. High Fidelity (HiFi) Interface. The unique design of the HiFi captures and reproduces the natural motion of the bone that moves upper and lower limbs. Whether you are an upper or lower limb loss patient, you'll experience a more efficient, better performing and more comfortable socket. If you are a transfemoral amputee, you'll be able to walk faster with a longer stride and expend less energy. Your balance when standing will also improve. If you're an upper limb amputee, you'll be able to carry heavier loads, lift your arm up higher, and have improved stability. You also won't experience the "sweat factor." Who can wear the HiFi? 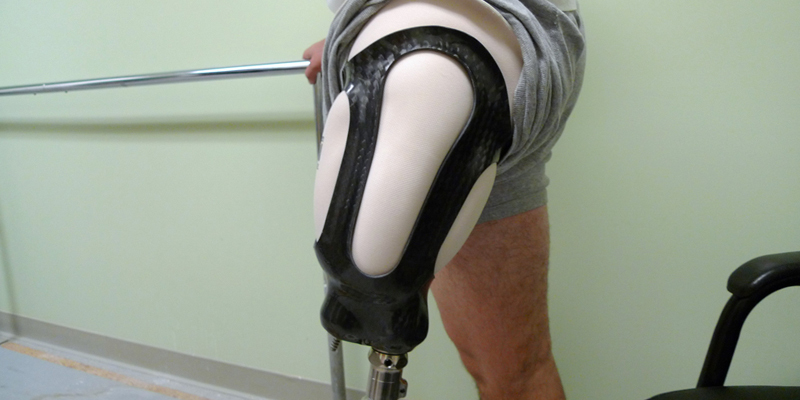 If you are feeling that you are not getting the most from your prosthesis, if you are feeling fatigued after only a few hours of activity, if you cannot sit comfortably, if you look forward to the time of day you take your prosthesis off, then you are a candidate for this breakthrough socket system. Don't waste any more time with a socket that isn't helping your mobility or functionality. Call Sampson's for a FREE evaluation and to experience the HiFi difference. Exclusive in New York State at Sampson's Prosthetic & Orthotic Lab. 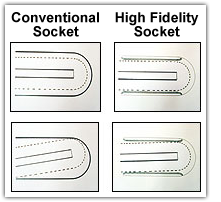 These images show the unique design of the HiFi. Four bar struts compress the tissue surrounding the residual limb, allowing them to flow through the window openings. As the tissue is compressed the socket gets closer to the bone, making it more responsive and controllable, as well as more comfortable. In a traditional socket, the soft tissue is enclosed or encapsulated, restricting the amount of control the socket can impart to the bone buried beneath the soft tissue.